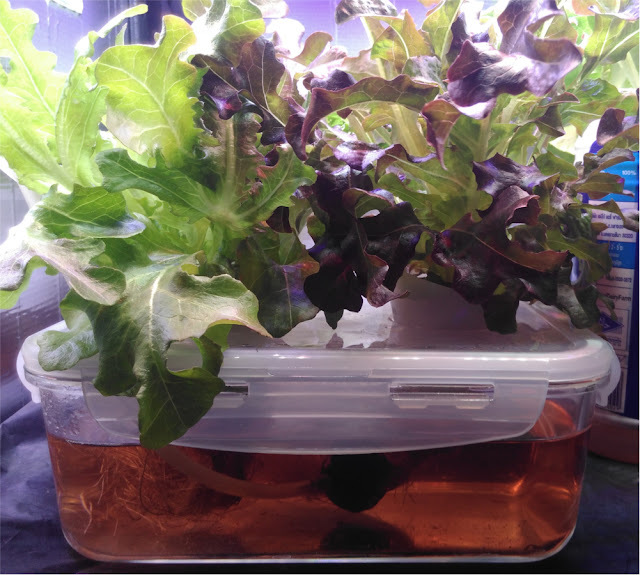 January 25, 2018 | ProgressTH.org Hydroponics is a method of growing plants without soil. It allows food to be grown virtually anywhere. It is a technical method that is easy to learn and get into, but takes a bit of time and patience to master. Luckily, it is not as intimidating as it may seem, and as more people begin experimenting with hydroponics, the wealth of information they are sharing online makes it easier than ever to get started. The dense urban sprawl of Bangkok makes it very difficult to grow your own food with traditional means. Safe soil in an open space with adequate sunlight is hard to find. Even on Bangkok's many rooftops where open space exists, bringing soil upstairs and maintaining a garden under the beating sun and amid flocks of marauding birds is a lot harder (we've found out) than it seems. Hence hydroponics. With hydroponics, you can grow food anywhere. Outdoors, indoors, with or without access to sunlight and without any need for soil. 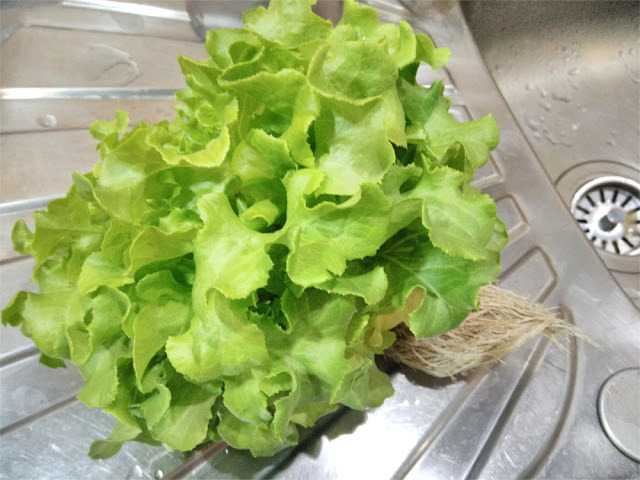 After experimenting with rooftop and balcony gardens with mixed results, hydroponics enabled us to finally grow enough food, indoors for daily consumption. For now we are growing only salad greens. But hydroponics can be used to grow a wide variety of fruits and vegetables. It is just a matter of adjusting your grow space, containers, nutrients, and lighting, all of which we will explain below. A hydroponics system can be set up anywhere. Ours consists of a large STACKO brand metal modular shelf from Home Pro, about 1.4 meters tall and 80 centimeters wide. We also have a smaller tabletop system build around a stainless steel rack bought from Daiso, a 60 baht shop popular in Bangkok. 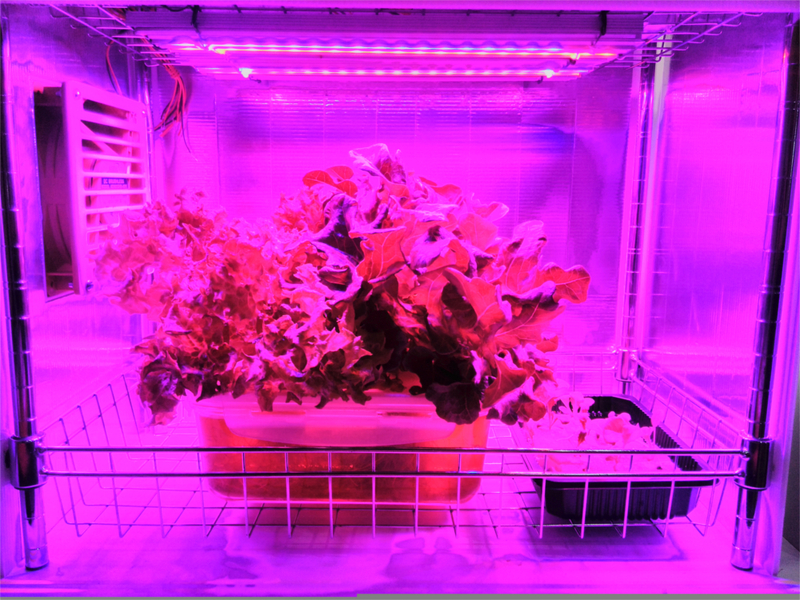 Both systems use corrugated plastic hobby board (called "future board" in Thailand) as side panels to control ventilation and by placing aluminium tape on one side, to reflect artificial light back onto plants. We use "super strong magnets (neodymium magnets) also from Daiso, and place them under the first layer of future board by cutting a small incision with a razor, then sealing it in with clear packing tape. This makes our panels magnetic, easy to remove and reinstall which allows us to easily make changes or access our shelves for cleaning and maintenance. A growing space can be any space you have to spare in your room. Just keep in mind you will be using water and electricity in close proximity. Ensuring your space is set up so any spill avoids your electrical system is key for safety. The actual containers you grow your plants in can vary. Many use plastic containers, but we sought to avoid any extra chemical contamination of our food so we opted for glassware. We cut two holes in the top of the plastic lid that comes with the glassware. We also cut a smaller hole for our air pump line which we'll explain later. The glassware is expensive and heavy, but is chemically neutral, will last forever, and if ever you decide to end your hydroponics experiment, you will have quality cookware to use in your kitchen or to store leftovers in your refrigerator. 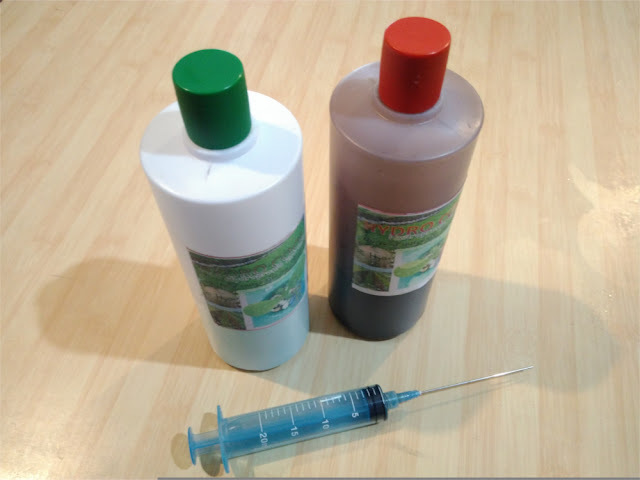 Hydroponics uses nutrients that are often sold as A and B solutions. For salad greens, we have been using 12 cubic centimeters of each in a 6 liter water bottle. A is mixed thoroughly first before adding in B.
AB nutrient solution bottles and a common cosmetic syringe with a blunt metal applicator. Measurements are in CCs, requiring 12 CCs of A and B respectively per 6 liters. Then we simply add the nutrients to the glassware container until it touches the sponge material our plants are growing in. As the plants grow larger, we fill the solution to cover only the roots, leaving the waterline below the sponge. Our nutrient solution is purchased from JJ Market in a garden section near the Marketing Organization for Farmers area. Before harvesting for eating, we make sure to switch out the nutrient solution for fresh water and let it sit for 2-3 days. From then on, we can pick leaves off and eat when desired until the plant's leaves are used up. Placing nutrients into a container with roots soaking in them does not work well without proper circulation. Some hydroponics systems use water pumps to keep a steady supply of nutrients flowing past roots before returning to a large container where the pump circulates it back up again. Others, including ours, use air pumps to agitate the nutrient solution. Air is fed into the nutrient solution and around the roots and also circulates the nutrients themselves around the container. Just barely visible in the glassware container is a silicon tube with an aquarium air stone providing air to the plant's roots and circulating the nutrient solution. We've found it is not necessary to use the air stone. We use commonplace aquarium air line splitters to divide up air distribution from our air pump to our multiple grow containers. We use typical aquarium air pumps bought from JJ Market and silicon (not PVC) tubing placed directly into the growing container (no air stone). This has worked best. 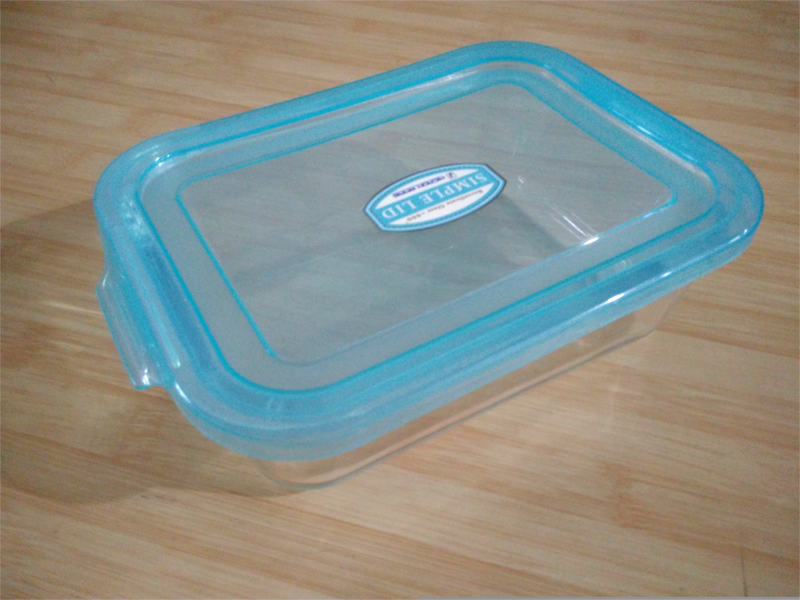 You can experiment on your own with two containers, one with air bubbling in, and one without, and see for yourself the difference. We have experimented with indoor lighting for years now, and have found a variety of ways to grow plants indoors. Previously, we used 40 and 50 Watt LED floodlights suspended above our plants. This worked well, but a floodlight creates a single spot of intense light, while a large indoor garden really benefits from a more distributed source of light. The LED shop at Bangkok's Chinatown that got us started with our LED system. LED strips are the answer, but require careful planning and wiring which in turn requires a little bit of electrical skills on behalf of those designing the system. We researched this step for some time before finally giving it a try. If done carefully and under the guidance of a professional, it is relatively easy and fun to learn how to safely design and build LED strip lighting systems. 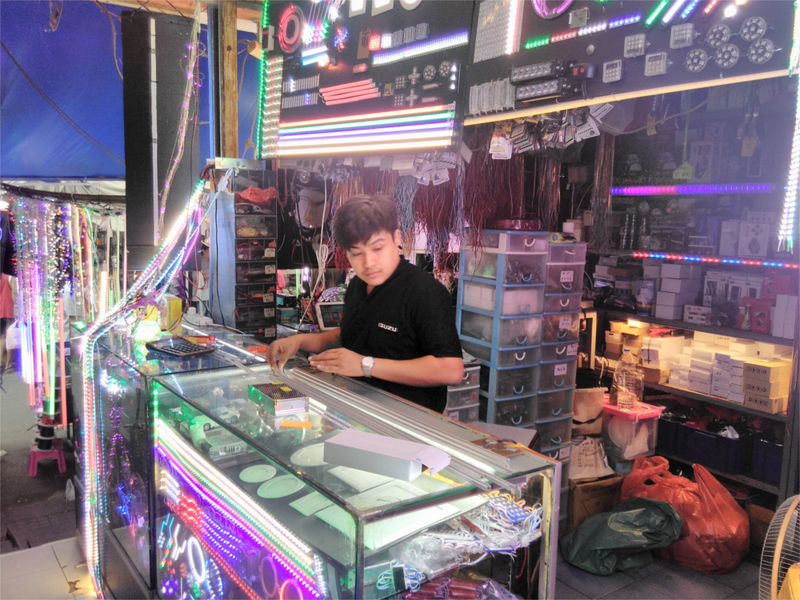 We traveled to Ban Mor in Bangkok's Chinatown where staff at one shop (www.LED-Kiriya.com) taught us everything we need to know about choosing LEDs, wiring them together, hooking them up to a power supply and a few safety tips. We also got helpful advice from Amorn at Fortune IT Mall. 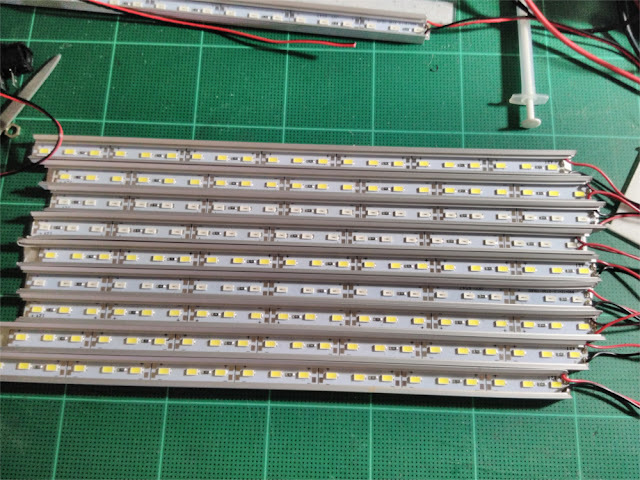 After cutting our 1 meter long LED strips, we created this second, shorter array. The red and black wires at the right are then wired into the 12V 20A power supply. The LED strips we used were 1 meter long 12V LEDs running at 1-1.5 amps per meter. We bought 6 white LED strips, 2 red, and 2 blue. The LEDs are intense, the brightest the shop had, and come in rigid aluminium bars that act as heat sinks. Because you can cut LED strips at their break points and use both pieces, we cut the strips off at 80cm (because our shelves are 80cm wide) and used the shorter length for our tabletop version. When mixed together, the color is mostly white with a tinge of pink. With our tabletop version we have only been using the red and blue which when combined make a purple hue common with indoor LED grow lights. We are experimenting to see the difference in mixing in white, using only white, or using only red and blue LEDs regarding plant growth. 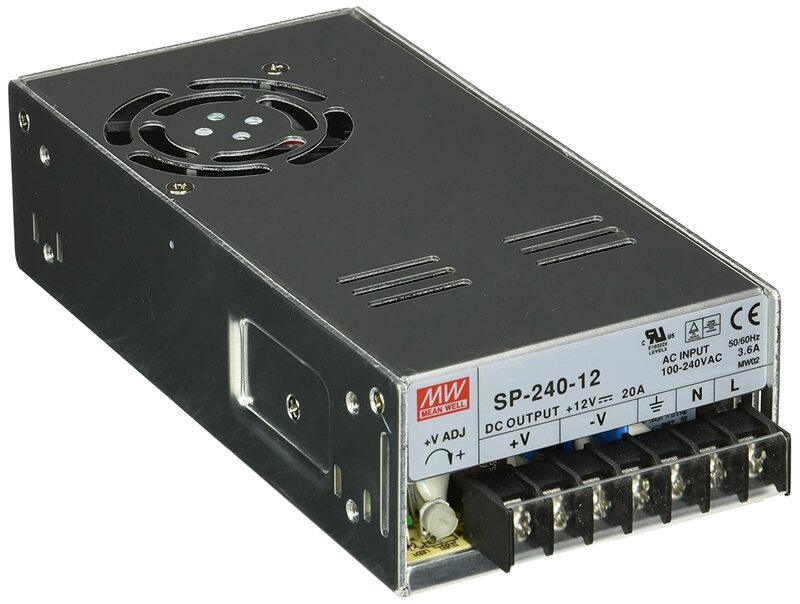 We are using a 12V 20A power supply like this one pictured here for both our shelf system and our tabletop system. The power supply has simple screw terminals. The main power plug we used had 3 wires color coded for live, neutral, and ground. On the face of the plug, the letters 'L' and 'N' help distinguish further which wire is which. Use a multimeter's continuity function to check, double check, and triple check which one is which before attaching the wires to your power supply. It is best to have a trained electrician check your work before plugging anything in. The other screw terminals are your 12v positive and negative connections. For the LED strips, we soldered wires to the positive and negative terminals on the strips, tinned the ends of the wires before connecting them to the appropriate screw terminals on the power supply. The power supply for our tabletop grow system pictured on the right. note the built-in fan. The cover for our grow system has a vent built into it to ensure an exit path for heated air expelled from the power supply. The power supply (and air pump left) is positioned at the top of the system to ensure water never drips, leaks, or spills on the electronics. Once everything is wired up, close the plastic protective cover and make sure your power supply is in a safe location; safely above any source of water, safely above and away from untrained hands of both children and adults who may be tempted to touch the power supply. We keep ours at the very top of the shelf in a plastic box with a fan built into it. For our tabletop version, the power supply is safely hidden in a vented compartment at the top of the system. 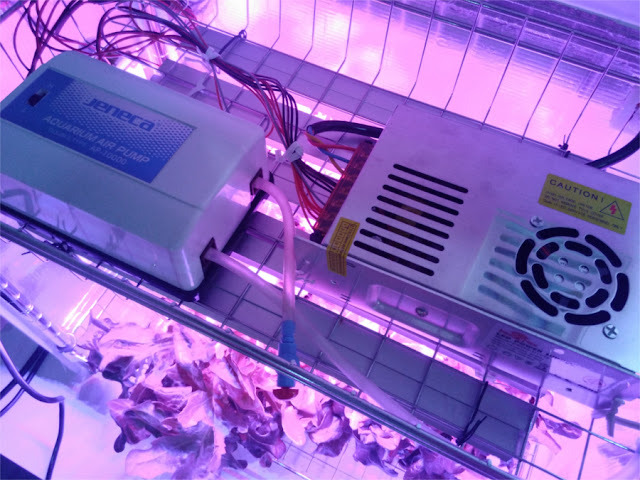 Power supplies used for hydroponics should have a built-in fan because they will be left on for long periods and get extremely hot. With a fan, the power supply will barely be warm to the touch. Without a fan, the power supply will become blazing hot in just a few minutes. The fan is a must. 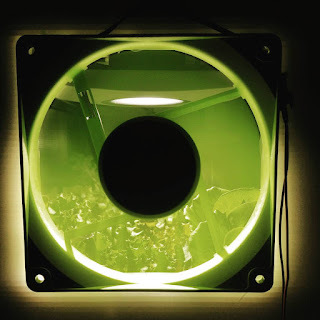 135x135 mm 12V DC computer fan for ventilation. 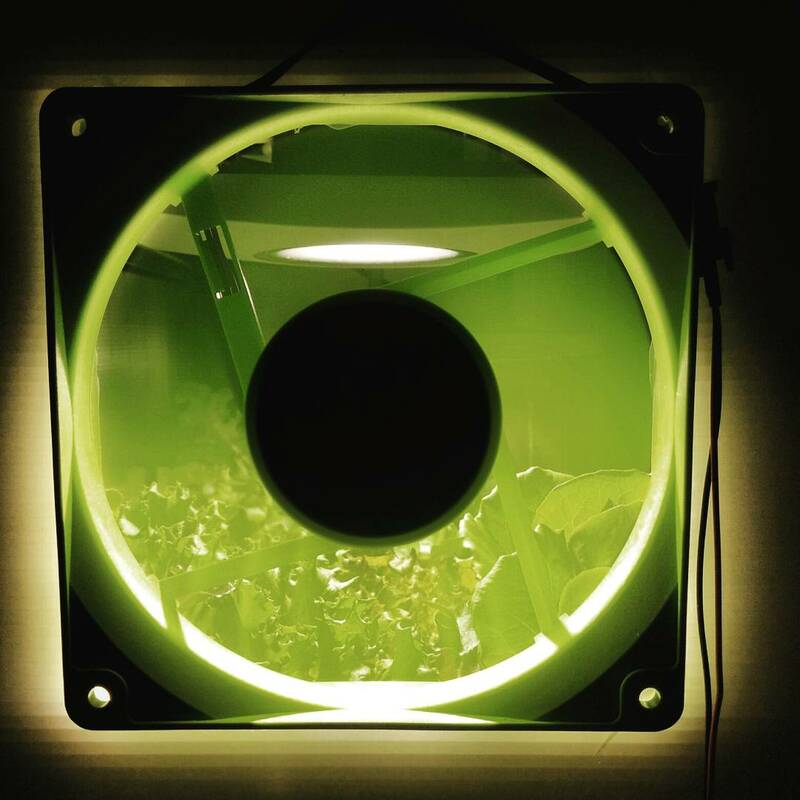 In addition to fans for your power supply, you may also want to include fans for cross ventilation to both keep a general flow of air moving through your greens to deter mold and to continuously remove excess heat from your lighting to prevent it from building up in your grow space. We use one 135mm computer fan for each shelf, and a similar fan for our tabletop system. The fans are 12V so we were able to wire them into the power supply used for the lighting. The fans themselves are installed into our magnetic panels. We simply cut a 135x135 mm hole out in the future board and hot glued them in. We used 3D printing to create covers for the fans to prevent fingers, tools, and greens from accidentally getting caught in them. In previous systems lacking large fans with adequate ventilation, we have experienced mold issues. Since using the 135mm fans, we have not had these problems. Our system requires the flipping of one switch on a power strip in the morning and evening to turn everything on and off. We manually flip this switch but it could just as easily be put on an ordinary timer you can buy from a home improvement or electronics store. While we would recommend leaving the power supply's mains wires alone, you could add relays and individual switches in for your 12V lighting and fans. These relays could be controlled by an Arduino or Raspberry Pi single board computer. Adding in simple rockers could also allow you to manually control your lighting and fans independently of the main power switch. This is how we are planning on experimenting with different LED color combinations. We are able to grow enough salad to eat everyday with just 2 shelves. Our tabletop system is also very successful and is allowing us to quickly experiment, prototype and improve our overall methods. In the future we may buy one or more extra shelves and begin producing for friends, family, and to sell locally. Our tabletop grow system. The power supply and air pump is hidden just above the LED arrays. It uses the same components as our full-sized shelf system, just with a smaller footprint. Unlike an outdoor garden, an indoor hydroponics system is easy to maintain, free of insects and mold (if ventilation is adequate), and requiring no chemicals. Maintenance is limited to turning on and off the power, adding nutrients as levels in containers drop, and replacing harvested plants with new plants sprouted in the same sponge blocks used in the glassware containers. The initial investment was around 6,000 THB ($200 USD), including the shelf, but the amount we save in growing our own food over buying it means that in just under 6 months the system has paid for itself. 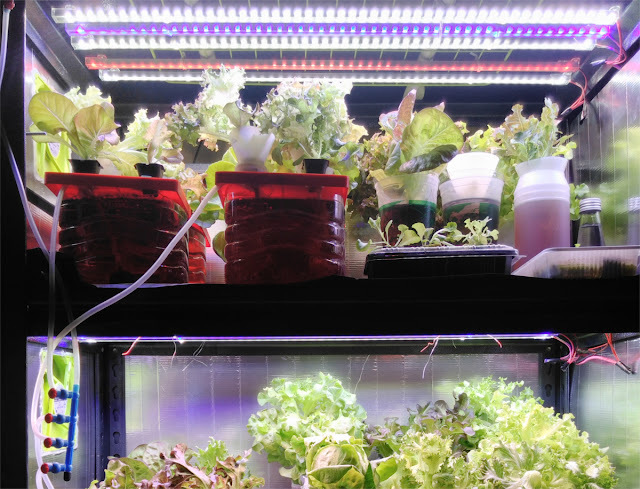 For makers and designers, the skills sets you will master setting up your hydroponics system can be used in a multitude of other projects. The knowledge we've gained just by learning about wiring up LED systems can be applied to many other projects. 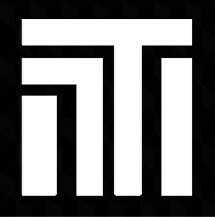 Information is available online. 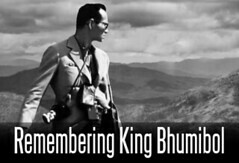 Pantip.com has a large amount of info regarding hydroponics and where to buy supplies in Thailand (in Thai). We will be covering DIY hydroponics much more in the future now that our system is up, running, and very successful., so stay tuned!